Making raw zucchini pasta is like Raw Food 101. Actually, I feel like I'm back in culinary school learning a whole new way of preparing food and eating. I've checked out just about every book on raw foods from my local library and I can't stop reading them. I'm so intrigued by the whole "raw" thing. To make this dish, it would be helpful if you had a mandolin to slice the zucchini into long thin strips like pasta. You can slice it by hand, but it will take some time and precision and presentation are really important when eating raw foods. You can purchase an inexpensive mandolin for about $20 from a restaurant supply store. Or another nifty gadget would be to purchase a spiral slicer, but they range in price from $30-$100. I may purchase one eventually, but for now my cheap mandolin worked fine. This is a perfect dish for summer and you can't get any fresher then this. If I wanted to make a raw pasta dish in the winter, I would use root vegetables instead and serve it with a raw sage-cashew cream sauce. Also, all of the ingredients for this dish should be organic. If you can't find organic then use a produce wash and scrub really well to remove any pesticides or chemicals. Rinse basil and place in a food processor along with garlic, pumpkin seeds and the juice of 1 lemon. Pulse, scraping down the sides of the bowl until you get a smooth consistency and then with the motor running, drizzle in olive oil slowly until emulsified. Season with salt and pepper and add more lemon juice if necessary. Note: Look for zucchini that are about 3" in diameter. If they are too thin you won't get as much yield, plus it's harder to work with when using the mandolin. If they're too large then they will have too many seeds and will be flavorless. Using the medium blade on the mandolin, slice zucchini into thin strips, on all sides until you only have the center core of seeds. 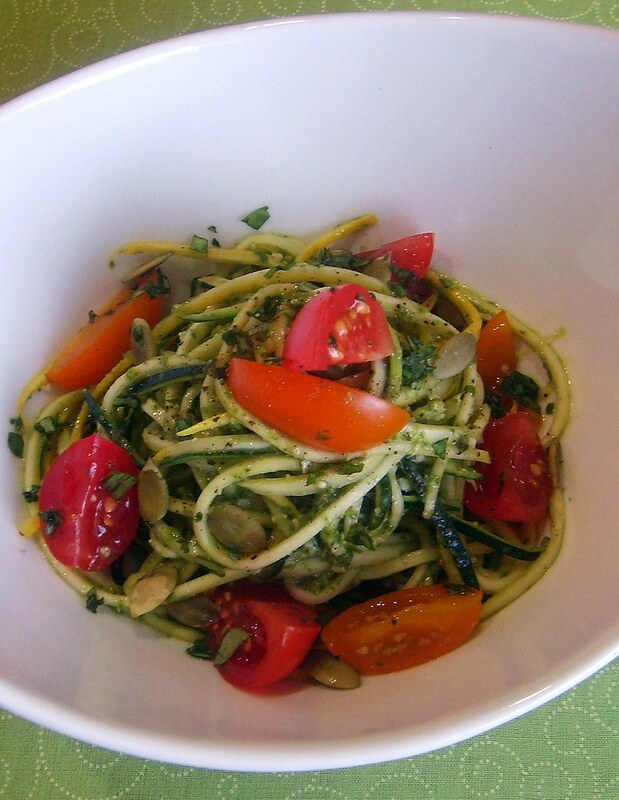 Place zucchini in bowl and toss with basil pesto, tomatoes and season with salt and pepper if necessary. Make sure that you toss the pasta just prior to serving. The zucchini breaks down really quickly if dressed too soon and you want to keep an al dente texture. Garnish with a squeeze of fresh lemon juice, pumpkin seeds, and chopped basil. Just delicious!